Finally after long time to wait I got information if I regarded and chosen as Chiba Ambassador. 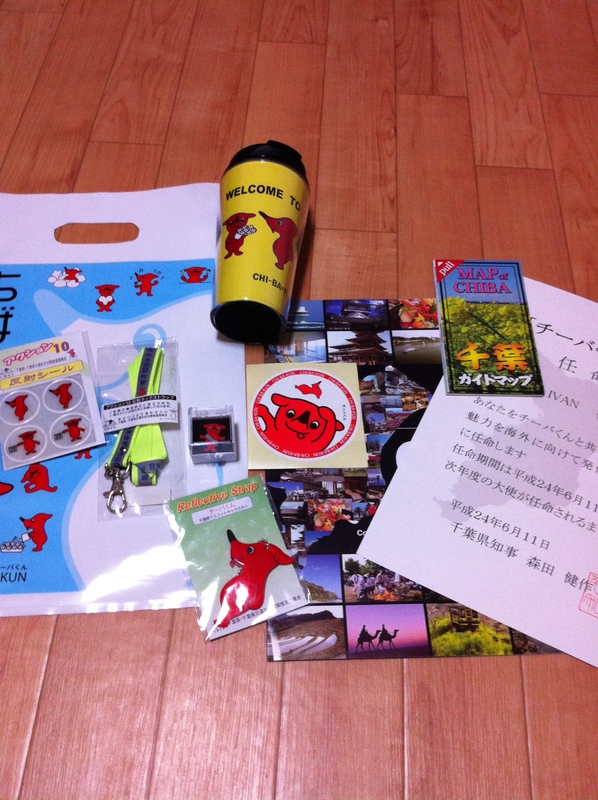 It become very awesome I chosen as Chiba Ambassador, and I feel so excited with that. 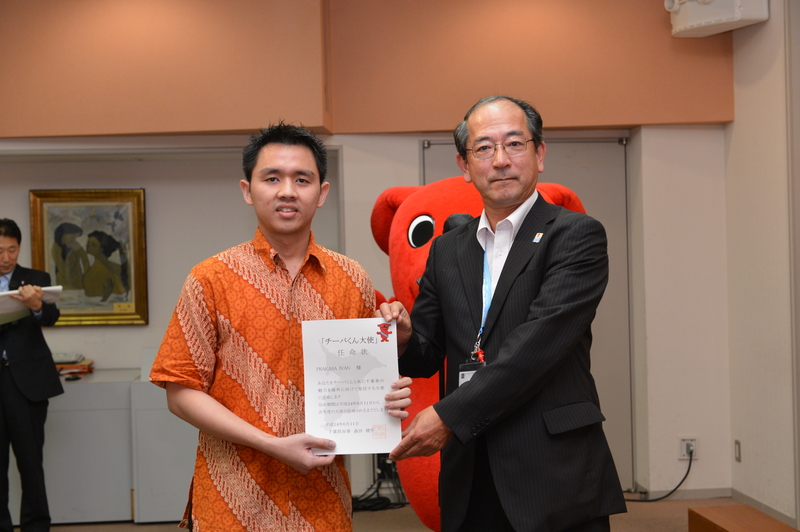 For people who still new comer in Japan and not so fluently to speak Japanese, I’m proud chosen as Chiba Ambassador. Last Monday, June 11th was the investiture of Chiba Ambassador and that was so great. Altough I have little problem and come little bit late, but somehow the investiture was so amazing. Use “batik” as Indonesian traditional clothes, together with the other foreigner who regarded as Chiba Ambassador, the investiture run smooth and orderly. The investiture also attended by the governor from Chiba Prefecture and also the mascot from Chiba Prefecture that is Chiba-Kun. 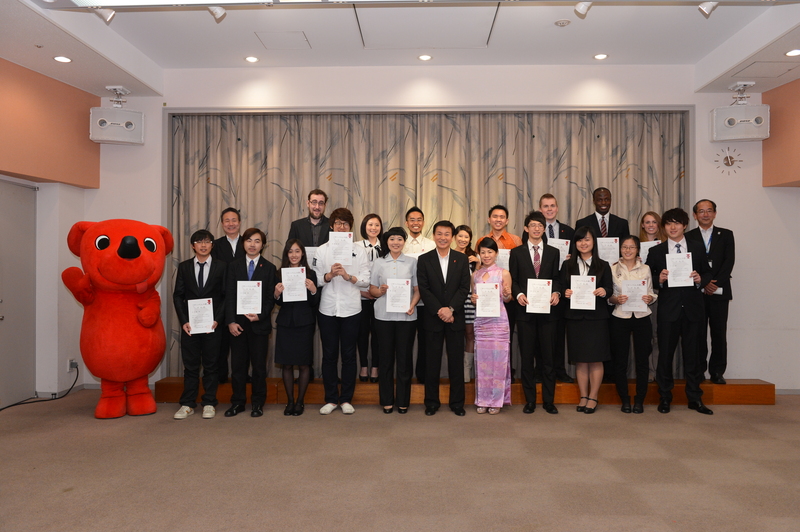 Investiture and Get Certificate (photo credit: Masataka Ishizaki). Chiba Ambassador Investiture with Chiba Kun (Mascot Of Chiba Prefecture) and Morita Kensaku (森田健作) the governor of Chiba Prefecture (photo credit: Masataka Ishizaki). Being a Chiba Ambassador we will get many things which indicates us as a representative for Chiba Ambassador from Chiba Prefecture. Like certificate, key-chain, sticker, tumbler, and many more. And absolutely with that things will help us to do our job as Chiba Ambassador. What is our job as Chiba Ambassador? 1.Proactively write about attractions in Chiba Prefecture (tourism spots, cuisine, daily life, etc.) on a regular basis in your blog, homepage, on facebook or other social media. 3.Participate in meeting about this project. 4.Submit a monthly report of your activities. 5.Participate in surveys sent out by Chiba Prefectual Government send out. In general, as Chiba Ambassador our jobs are support and promote Chiba Prefecture to international world especially to our country. If you wish to know detail about Chiba better to visit the official website of Chiba Prefecture to prevent my wrong explanation or misunderstanding. I just want to share my feeling and my opinion when I stayed in Chiba until now. In my opinion, I can said if stay in Chiba was a smart way to living in Japan. Food, rent apartment and the other things cheaper than in Tokyo. Beside that, in Chiba sometimes we can see many ricefields and air in Chiba more fresh and natural. Chiba also have many beautiful sightseeing. One the most popular is Tokyo Disney Area with Tokyo DisneySea and Tokyo DisneyLand as the main interesting part. Both of DisneySea and DisneyLand have own appeal and I really reccomend both of them when you visit Japan. You can find the other interesting place in Chiba from official site in Tourist Guide. However as Chiba Ambassador on the next post I will reccomend others interesting place that I found from Chiba Prefecture. Until then, if you want to visit Chiba and have some tour in Chiba you can contact me by leaving comment in this post or contact me via my twitter or my facebook. And I would be very happy accompany you when visit and tour in Chiba Prefecture. ini periode ambassador-nya 1 tahun yak? tapi kayaknya bs extend juga klo kinerjanya bagus kayaknya. Yg senior dan tahun ini dilantik lagi tahun ini masuk TV.